Few things can be as confusing as figuring out when to start claiming Social Security benefits. When you’re married and heading into retirement, that’s doubly true. A dizzying array of variables can significantly affect how much your household will be receiving over the coming decades. Starting with the view from 30,000 feet then drilling down into specifics, here are 10 things that all married couples should know. In order to qualify for Social Security benefits, you must amass 40 “points” throughout your lifetime. The amount of money necessary to earn a point goes up with inflation; In 2018, you will get a point for every $1,320 you earn. The maximum number of points of points you can earn in a year is four. Therefore, if you earn $5,280 this year, you will get all four possible points. For many, ten years of working is all that’s needed to qualify. You receive 90% of the first $885 of monthly income in benefits. You receive 32% of monthly income between $885 and $5,336 in benefits. You receive 15% of monthly income above $5,336 in benefits. There are maximum levels of benefits you can receive, but very few people qualify for them. For those born before 1955, full retirement age -- the age at which you’d receive the benefits from the previous calculation -- is 66. However, that’s changing: anyone born in 1960 or later will see their retirement age start at 67. If you were born in-between, the change will gradually go into effect in two month increments. You can claim benefits as early as 62 years of age, and as late as 70. 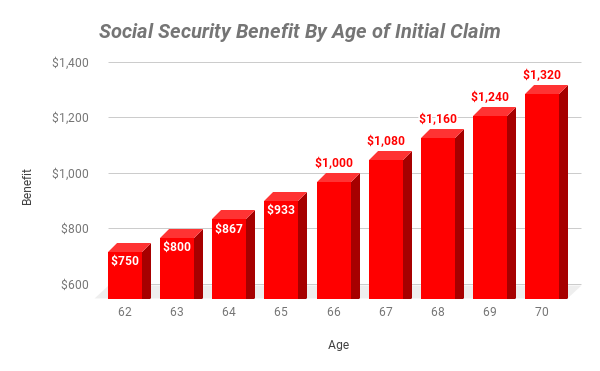 For illustrative purposes, the chart below shows how your benefits can change, assuming that you are entitled to a $1,000 monthly benefit at full retirement age, and were born in 1954. Because it’s not uncommon for one spouse to be the primary breadwinner while the other spouse stays home to help raise a family, spousal benefits are also available from Social Security. Once the lower-earning spouse claims benefits, they will get an initial amount based on their own work history. If/When the higher-earning spouse claims benefits, the lower-earning spouse’s monthly benefit could be supplemented further. If the benefits you receive from your own work history are greater than what you are entitled to under spousal benefits, you do not receive spousal benefits. You can see more on how timing affects your benefits in what follows. 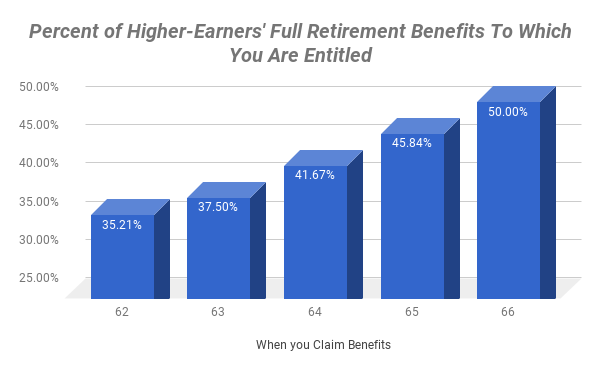 It’s important to note that the lower-earning spouse doesn’t have to wait until the higher-earning spouse claims benefits to start receiving benefits. Until the higher-earner starts collecting, however, the lower-earner will simply be receiving benefits based on their own work record. Your spousal benefits will be based on two things: the age at which you -- not your spouse -- start receiving benefits, and the benefits your spouse is entitled to at full retirement age. For those born before 1955, the below chart shows what those percentages look like. If you were born after that date and want to see how this would work, the Social Security Administration has a tool to help. However, even though your spouse’s benefits can continue to climb if they wait until after full retirement age to claim, yours do not. There is no immediate financial benefit to your monthly spousal benefits if you wait until after full retirement age to claim Social Security. Sadly, it’s also important to plan for what happens after one spouse passes away. No matter what, when this happens, the total amount of income coming from Social Security within a household will fall. The surviving spouse will either keep their own current benefit, or the benefit of the deceased -- whichever is higher. This is why some couples might choose to have the higher earner wait until after full retirement age to claim Social Security. Even though it means the spouse has to wait to gain access to spousal benefits, it increases the amount available if/when the higher-earner passes away. If all are true, then the Social Security administration treats your spousal benefits the same as if you were still married. The one difference is that -- as long as you’ve been divorced for two years -- your spouse does not need to have claimed benefits for you to start receiving them. Finally, there’s a provision that’s worth mentioning when there are older parents involved -- which is becoming more common as couples put off having children. If the lower-earning spouse is staying at home to help care for his/her child under the age of 16, then that spouse is eligible to receive full spousal benefits once the higher-earner has started claiming benefits. Of course, this is the case even without children -- the catch is that the spouse can be under 62 years of age and still receive these benefits until the child is 16. Everyone’s situation will be different. And this list is far from exhaustive. But if you consider these ten things, you’ll be ahead of the curve when it comes to ensuring that you get all you’re looking for from Social Security.